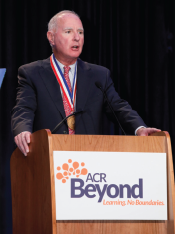 ACR Gold Medal Winner, Dr. Michael Weinblatt provides brief remarks during the awards ceremony in San Diego. Education is a vital component of what the ACR provides to rheumatology professionals around the world, and the ACR’s commitment to continually expand options to access the latest science and medical education is critical to all involved in the specialty. This dedication is reflected in the ACR’s new mission, vision and brand promise, all of which were developed in tandem with the new five-year strategic plan. Our promise to you—a rheumatology professional—is that we are here for you so you can be there for your patients. ACR Beyond is a demonstration of that promise. ACR Beyond is the ACR’s new education platform that allows us to bring cutting-edge education to you anytime, anywhere. Because the ACR’s reach and membership are international, ACR Beyond was developed to be a global platform. It is available to anyone with an Internet connection. With the launch of ACR Beyond at the 2017 ACR/ARHP Annual Meeting, we have seen colleagues join from 70 countries, including Afghanistan, Argentina, Malaysia, Mexico, New Zealand, Nigeria, Saint Lucia and Slovenia, to name a few. Users can view past ACR meeting sessions or virtually participate in live streaming of select meetings. The goal is to provide learning without boundaries. The ACR took the first step this year in San Diego as attendees worldwide joined the ACR Review Course in real-time via live stream. Using the platform’s networking component gave participants the ability to chat, ask questions and share reviews, making connections among attendees possible even when remotely accessing an event. Although they were not physically in San Diego, they were able to participate virtually and chat with others viewing the live stream. Dr. Anthony Fauci, head of the National Institute of Allergy and Infectious Diseases, addresses attendees in San Diego during the keynote presentation. The ACR/ARHP Annual Meeting provides an unparalleled opportunity to meet and network with colleagues. However, time is limited, and it’s exciting to have the opportunity to join our colleagues for these premier sessions even if we cannot be there in person. This is a tremendous step forward in making learning more accessible. Two services are available through ACR Beyond. 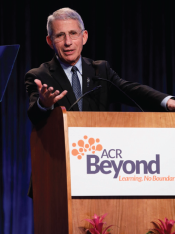 The first, ACR Beyond Streaming, is an annual subscription service providing access to hundreds of hours of top-rated educational content from leading experts. New content from past and current ACR meetings, such as the Winter Rheumatology Symposium, the State-of-the-Art Clinical Symposium and the Annual Meeting, is added monthly to keep you engaged and empower you to treat your patients with the highest quality care. New features will be added to the ACR Beyond platform in the coming months to enhance your educational experience throughout the year. And the ACR’s education team is offering a seven-day free trial to get you started.